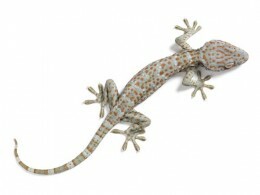 The tokay gecko is reputed to have HIV-fighting properties, though there is no scientific evidence to support that notion. And it's been an ingredient in Asian traditional medicines for lots of other uses, including cancer. Lately, though, the market for the lizards has really caught fire, leading the conservation group TRAFFIC, which monitors international trade in wildlife, to sound an alarm. The surging "demand for tokay geckos is leading to the rapacious collection of this species throughout Southeast Asia," the group said in a new report (see page 9-10 in PDF). The group says "incredible claims of miracle cures and vast monetary gains may be indicative of an elaborate hoax." The species, though under increasing pressure in such places as Malaysia and Indonesia, isn't on the endangered list maintained by CITES, an international group that regulates the wildlife trade. TRAFFIC says it will investigate the trade of the species in Malaysia, which the group says "appears to be playing a central role in the recent boom in the tokay gecko trade." The Philippines are another important source of the lizards. A few months ago the government warned people not to trap and sell them. It's against the law there. And a top health official warned there is no basis for the use of the lizard as a "cure for any ailment."